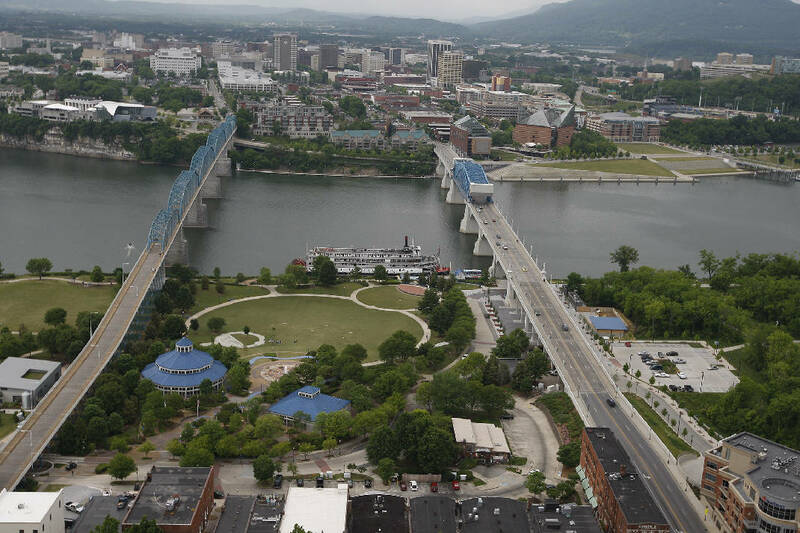 Aerial view of Coolidge Park and the Tennessee River in Chattanooga. A New York-based advertising agency and related venture fund with offices in Manhattan, San Francisco and Los Angeles has chosen downtown Chattanooga for its fourth office as it moves into America's heartland. VaynerMedia will open a 10- to 12-employee office in Chattanooga in July to tap into the city's growing startup and tech industry in Chattanooga's new Innovation District. The ad agency, which was started just six years ago by Internet poster child and social branding expert Gary Vaynerchuk and his brother AJ, will locate its newest office in downtown Chattanooga in space adjacent to the Lamp Post Group in the Loveman's building. Mickey Cloud, the VaynerMedia vice president who will be in charge of the new Chattanooga office, has spent the past eight years in New York, including the past four years with VaynerMedia helping to build the agency's annual revenues for 2014 to more than $40 million. "We're really excited about what is going on in Chattanooga with the entrepreneurial scene and the encouragement and enthusiasm that the city has for technology, for startups and for entrepreneurs," Cloud said Friday. "We've always had startup and tech DNA in our blood since Gary and AJ (founders of the company) came from the tech scene, not the marketing world." Vaynerchuk said the company has four or five companies it will initially serve in Chattanooga and he hopes to expand the business base "by accessing startup and big companies in the Southeast." Vaynerchuk also owns a $25 million seed capital fund along with Miami Dolphins owner Stephen Ross known as Vayner/RSE. The fund has invested in 93 companies "and is looking to make other investments across the country, including possibly some in Chattanooga," Cloud said. Vaynerchuk come to the marketing field from a technology background and has been busy through much of his career as a wine entrepreneur and daily blogger, as a judge for the Miss America pageant and as an author and speaker. He was an early adopter of Google Adwords to launch his online wine business and an early-stage investor in Twitter and Uber, among other tech firms. Vaynerchuk said his ad firm is "very deep into coast mentality" and said the Chattanooga presence will offer a new perspective for the growing firm. Vaynerchuk came to Chattanooga and visited the Lamp Post Group in 2013 while promoting his book Jab, Jab, Jab, Right Hook. Lamp Post Partner Ted Alling, then head of Access America in Chattanooga, recruited Vaynerchuk to speak in Chattanooga in 2014 and to open a regional office for his digital ad agency.